Just after arriving at ECO this morning, after a slightly rushed breakfast of tea, bread with cheese and bread with peanut butter and honey, I discovered that the serial port of my PowerBook was dead. I was having trouble using my external modem, but I figured it was a loose connection somewhere and rushed off to a a morning geek meeting with David Buschman, a long-time resident (who thirty years ago lived only several hundred feed from where I now live in San Francisco). 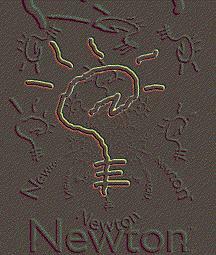 There I saw that my PowerBook couldn't talk to his Newton, and it dawned on me - ack! serial port problems. After a bit of testing I can summarize the things I can't do with my formerly-healthy serial port: I can't talk to my external modem, QuickCam video camera, my Apple QuickTake 100 digital still camera, nor to my Newton. The chances of three cables and three devices going bad all at the same time are just too slim to be seriously considered. Not having a working serial port is seriously going to hamper my three-month plan: I can't communicate my work to my publishers, I can't stay in touch with friends, and I can't take digital pictures of my travels for these web pages. What to do? I shake my PowerBook, blow air through the serial port, double-check that I can't see anything blocking a pin's path. To no avail. With a smug grin I reach into my bag of tricks and pull out a PCMCIA modem. "This," I think, "is sure to do the trick. Even if the serial port is out for the count, I can stay connected via this baby!" I insert the card into the PCMCIA slot of my PowerBook, and plug the phone cord into the card. I tell the telecommunications software that I'm interested in using the card, and we're off -- and into a brick wall. I can connect with the Spanish Internet Service Provider, but after the modems negotiate a connection nothing comes through. I spend the afternoon in a quiet fury, trying different initialization strings (ATX4M1), different slots, different speeds, but nothing makes past this new hurdle. A bit of asking around results in my determining the nearest registered Apple technican - on a neighboring island. So that's who I'll call first thing Monday morning. Sigh.